Cloudflare switching to ARM Server, Intel "free" by Q4. I have to admit i was surpassed. Because I remember Anandtech doing an Article on Centriq and it wasn't at all impressive. So the number from Cloudflare, and Qualcomm TCO  seems strange. Then i realise I had it wrong, the article Anandtech reviewed was ARMv8 but from Cavium, this one from Qualcomm seems impressive enough. And it is much cheaper then Intel. The most interesting is the last 2 paper. Redis smells like Baidu to me, which has the largest number of Redis instance in production. HHVM could be Facebook, Wikipedia, Wordpress or all three. All these companies are running thousands of servers. I never thought the day ARM's attack on server would come so quick, judging from Ampere and Cavium. But it seems Qualcomm has something right. And they have more improvement coming next year, as compared to Intel which is more of the same. No wonder why they have uArch and Node First Strategy for their DC Segment. That was what I thought as well, until we factor in TDP. The current Centriq chip is not running at maximum TDP compared to the Turbo Boost Intel had which means it is running at max all the time under load. Golang, Linux patch, all landing soon. Do note though, Qualcomm is one of the Cloudflare Investors. But i dont think this makes any different in those benchmarks numbers. the above comparison obviously ignores EPYC completely which already is way better than intel in term of performance/$. 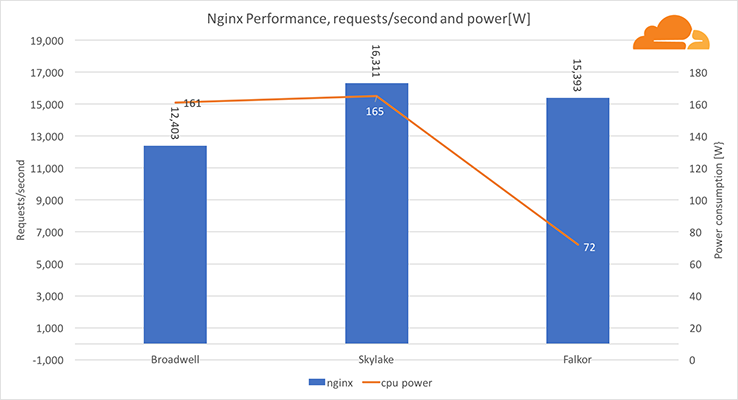 Cloudflare argue they do not care for perf/$, only perf/watt. Their workload is so specific they claimed they would not choose Intel's products over Qualcomm's even if Xeons were given for free. Personally I think the fact that Qualcomm is a direct investor in Cloudflare cannot be overlooked, and I'd rather see more tests from other parties. I agree, but do you think they'd put themselves in danger just to please one of their investors? No sane company would do that unless it's fully subsidized. Ask yourself this: what sane company CEO publicly burns bridges with his lifelong CPU supplier by touting their competitor's supremacy? It's one thing to (entirely) switch suppliers, another thing to post kill-a-watt pics and suggest Intel's products are more expensive even if given for free. These are 100% PR moves and I doubt Cloudflare needs the publicity. This is specific use case stuff. For what they are doing it makes sense. For this to work, the product has to be competitive or else Intel would just laugh at them when asked for a price reduction. Anyway I want to see independent benchmarks. Or find time to do it myself. In order for Intel to fear the competition, you need to prove that you are willing and able to switch. That's exactly what Cloudflare is doing. It is not only this specific use case. I can't go into details, but there are applications, where Centriq advantage is much bigger than here. Basically, Centriq has chance to beat Xeons in every field, where Xeons managed to beat big iron architectures (zX, SPARC). And off course, Centriq lags where Xeons failed too. Anyway, Cloudflare's announcement seems little rushed to me too, although they hold software stack so they must know what they are doing. For any wider deployment there is still lot of work to do on both software and hardware. First thing what Qualcomm should do is push 7nm version out ASAP. 2 nodes advantage would be something what can't be ignored even by companies not willing to switch architectures. How is inter core latency both in the cross ring bus and in the shared L2 situations? Those two things always looked the worst to me, large number of ring stops, write combining etc into your "fast" L2(hello bulldozer). The start of 7nm is probably tricky for QC, if they stick to Samsung its going to be a while and i imaging TSMC and GF 7nm capacity is going to be in high demand. write combining etc into your "fast" L2(hello bulldozer). Bulldozer is write coalescing which is two addresses in L1D0 and L1D1 gets coalesced into a single address in L2. Write combining is used in pretty much all P6 on wards for Intel. Which reduces the multiple transactions between L1 <-> L2 into fewer transaction and speeds up the processor. All WCB/WCC enhancements can be defeated, the same with OoOE can be defeated or speculative execution can be defeated, or branch prediction can be defeated, etc. fyi; both cores in Bulldozer have WCBs which buffer into the WCC. 2 x 4 64-byte WCBs go into 1 x 64 64-byte of the WCC's WCB of the WB type. Write combining isn't an issue. So, in the Centriq design it isn't an issue. I think its obvious what i am talking about, The L1D's are write through to a inclusive shared L2, this has an impact on maximum write throughput as well as latency. AMD's Bulldozer is more efficient in regards to memory operations. So, the decrease in bandwidth and increase in latency is mostly alleviated by the various SCB, CB, WCB, WCC, etc. SCB is the store coalescing buffer, it buffers stores going to the L1ds. So, it only needs to be get to the buffer once, then broadcasts to both cores. WCC -> L2 -> Memory or L3. WCC is fully inclusive with L2. What doesn't exist in L2, doesn't exist in WCC. What doesn't exist in L2, does exist in L1d. L1d is mostly inclusive with L2. It should be Higon/Hygon(THATIC-AMD JV)'s first custom core. Also, it may or may not be x86 by the way. Origin core is Broadcom's Vulcan. Is a pure server solution, which is perfect for something that is only on paper related to Bulldozer. As mention they only care about pref / watt. Or more like their Workload/Watt. Since the numbers are so in flavour of Qualcomm, Cloudflare is just doing its investor a flavour. Given Cloudflare is now tuning Linux, LuaJIT, Go, and all the Open Sources software stack it is using. It is likely the software investment now into Centriq would level out all the saving they have. But in the long term it benefits Qualcomm and everyone else. Qualcomm already has improved Core and IPC for 7nm Centriq in the pipeline likely coming in 2019. Intel will have 10nm ( A node that should be slightly better then Samsung's 7nm ) at around the same time. So it really isn't a advantage. All power that is consumed by IT equipment is converted to heat. Though power is typically reported in watts (W) and heat is typically reported in British Thermal Units (BTUs) per hour (BTU/hr), these units are in fact interchangeable. Although power is almost always reported in watts, heat load is commonly reported in watts or BTU/hr. The conversion from watts to BTU/hr is 1W = 3.412 BTU/hr. So, for example, a server that consumes 100W produces approximately 341.2 BTU/hr of heat energy. This study demonstrated major improvements in data center power and cooling efficiency. Even though an increase in hardware installations caused the IT load to increase slightly (from 1719 to 1761 kilowatts [kW]), the overhead for cooling the data center dropped (from 801 to 697 kW). The overall power usage effectiveness (PUE) dropped from 1.48 to 1.36. The payback from the proof of concept was 6 to 12 months. The ideas from this pilot project are being applied to all Cisco facilities and are projected to save US$2 million per year. $2M per year from efficiency changes without changing equipment. That's not chump change. If Qualcomm can provide 90% of Intel's performance with only 60% of the heat production in Cloudflare's specific case then yes, performance/$ is basically moot. This makes sense, also the reason FB dumped all those 2670s in favor of the PHIs. Huge upgrade expense but pays for itself in scale PDQ! Does anyone know if these Centriq Core, ARM64 only, are coming to Desktop? Microsoft has emulator that could run Windows software on ARM64, I wonder how this will perform. ARM based SoCs should be available in production delivery CRAY HPCs this month. See http://gw4.ac.uk/isambard/ for some background. The top-ten UK Met Office / University HPC applications have been run on the CRAY-CAVIUM-ARM machine, and ported very quickly; this includes the standard weather-forecasting application for the UK Meteorological Office. Eight out of ten applications were in FORTRAN. The software-stack is there. The CRAY machine uses CAVIUM Thunder X2, and the CRAY ARIES fabric. It is scaleable to very large scale. CRAY have developed an ARM-specific FORTRAN compiler. The CAVIUM Thunder X2 is very effective, as it has superior I/O performance, which is a prime requirement for almost all the top-end HPC applications. Also, it is worth searching YouTube using "charbax hpc arm" for a more general picture of ARM-based HPC designs. U.S. Government labs are researching the use of ARM-based HPC solutions. ARM have arrived in HPC. Start of transition of AI inference off Intel CPUs to accelerators. You forgot to add TSMC 7nm beats Intel 10nm in HVM. What do you guys think about Dell AMD EPYC based servers?